Air Permits at the MPCA! Time to sit right down and write a Comment to the MPCA about the Titan Lansing sand processing and loading facility in North Branch. Scroll down for the primary documents. The notice does not list an email for Luberda or a MPCA comment url, so I called him up to get his email. I asked if they’d correct this omission, and got a non-responsive response. Tiller Sand transloading facility… If you recall, this was that Tiller Sand facility that they built and started operating WITHOUT ANY PERMITS, just went ahead and did it. That said, their history isn’t exactly as pristine as… well… as pristine as frac sand! Then it was sold to Titan Lansing in November 2014 (see comments about air quality and permits in this article). Please say no to S.F. 1735, a bill that would result in removal of the regulatory protections for rate-payers and the public, and let utilities have the ability to charge us for private costs, and costs that have not been demonstrated to be prudent expenditures. Little by little, Xcel Energy’s e21 Initiative is slithering into bills before the House and Senate Energy Committees. Before anyone can vote on these bills, they should read Alfred Kahn’s “The Economics of Regulation,” both Volume 1 and Volume 2. Tomorrow, S.F. 1735 (see companion HF 1315)and S.F. 1431 are in Committee, and they’re supposed to vote on the Energy Ominous bill. SF 1735doesn’t have the part about “Competitive Rate for Energy-Intensive Trade-Exposed Electric Utility Customer” part that HF 1315 does, though we’ll see what the mines and Koch Refinery have to say about that when the Energy Ominous bill comes together and everyone has their hand out and foot in the door. SF 1735 is a problem because… where to start… the first problem is that it proposes, as Xcel does in e21, a BUSINESS PLAN which “replaces a general rate case filing,” REPLACES! The standard it must meet is that it result in “just and reasonable rates,” and there’s nothing about “prudent” and there’s nothing about being in the public interest. DOH! PUC decision based on “stakeholders” and deals with Xcel Energy? No, I think not. Per the House hearing on HF 341 (see also S.F. 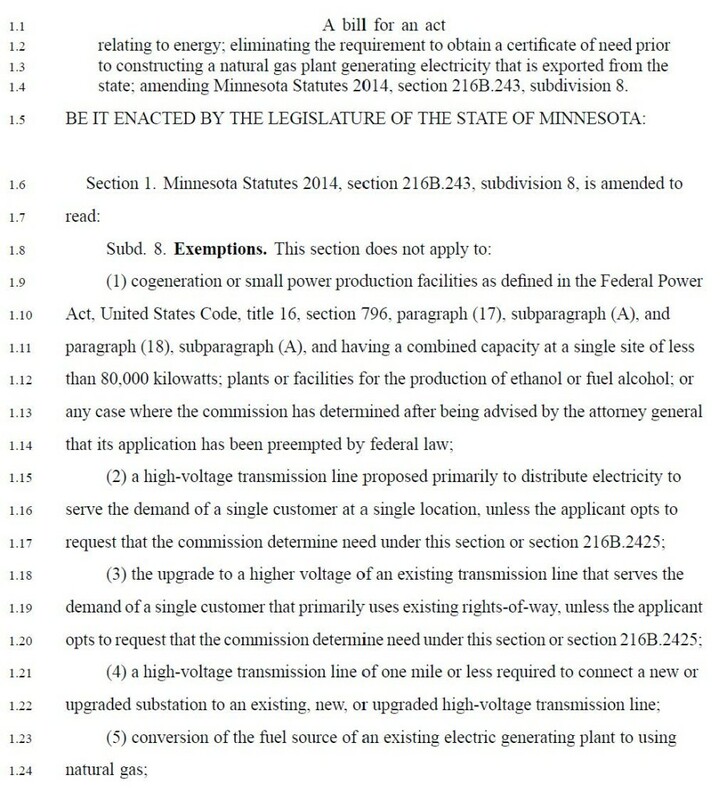 237), Minnesota should now be an electricity exporter, which is one between-the-lines goal of e21 Initiative, the others being ability to build without demonstrating need, to use ratepayer money for market development, to eliminate contested cases and use “Settlement Agreements,” which they’ve done expertly in the past. Exporting for profit is doable, now that we have the transmission in place. It would help Xcel Energy to just get rid of that Certificate of Need requirement, which HF 341 would do for natural gas plants of any size, i.e., 800 MW (like the LS Power Sunrise Station proposed for Chisago County, Lent Township) if it’s for sale into the MISO market. As you know, also up for consideration is SF 306 & 536, HF 338, which would lift the nuclear prohibition and allow a CoN for Monticello or anywhere. There’s no need, instead there’s excess generation, but that electricity could also go into the market, and with Construction Work in Progress, Minn. Stat. 216B.16, Subd. 6a, we ratepayers could pay for that private market activity. NO. NO. NO. The situation we’re in is NOT new to Xcel or any other utility. Distribution system is utility responsibility as franchise holder and regulated utility, but they’ve neglected the distribution system over decades. They have chosen not to upgrade and not to bring it into the 21st Century. That neglect is not ours to correct. Xcel has twice tried to invade and inflict communities with transmission when they had identified a distribution system deficit — Hiawatha and Hollydale. NO! Transmission deficit a decade ago was caused by putting so many IPP gas plants on line without requiring transmission upgrades. This is reflected in the TLTG tables for the SW MN 345 kV line, PUC Docket 01-1958. It also became an issue when Big Stone II was proposed because at that time it was “cause cost pays” and they hadn’t been charging gas plants but were going to charge BSII for interconnection costs, and BSII objected (see “standstill agreement” and withdrawal of Bill Gates’ Cascade Investment from that project at Legalectric: Bill Gates & Otter Tail at the PUC Tuesday…). That transmission CoN was denied, approved, and plant was withdrawn so non-issue. Then utilities and paid-for-NGOs went to MISO and FERC to find a way to spread the payment of transmission construction costs around, which they did. The ones building it are not necessarily the ones paying for it, and it’s us ratepayers paying for transmission construction all around the country (See Schedule 26A, MISO Tariff, also Tariff MM) and the PUC has yet to address whether that should be paid for by us — but wait, it’s FERC rates, so the PUC has no say… well, that MISO MVP bill hasn’t come before the PUC yet, and that’s the last thing Xcel wants. That capital cost is for private purpose transmission (market transactions) and as such, it is not ours to pay. Rates — Utilities want out of rate cases! Of course they’d want that, Xcel has lost ground in their rate demands the last few rounds. A Business Plan is not adequate, however, they need to prove up their expenditures if they expect us to pay them, and we should not, must not, be assessed for their market private purpose expenses, like transmission for export. The bills for CapX 2020 ($2 billion) and for MISO MVP projects ($5.2 billion across Midwest) are the types of large expenses that they do not want to have to justify. Not wanting to go through a rate case is no reason for us to let go of that protective review, or to let them charge us for things that are not public purpose expenditures necessitated by their obligation to provide universal service under their franchise. Deregulation — this “e21 Initiative” looks and feels like the 2000 deregulation push to me, particularly with all the support from “environmental” and “advocacy” organizations, well funded, and funded I believe by Xcel and cronies (and that information should be made public). Utilities wanted deregulation (back when Enron and Xcel’s NRG was making 300% profits screwing over California in an orchestrated rate skyrocket) and at that time, Xcel had all the “environmental” organizations behind it as “inevitable restructuring.” Everyone was jumping on the deregulation bandwagon, all bozos on that bus, and that’s how this e21 feels. Lots of people agreeing without knowing what they’re talking about, without understanding the consequences. Back in that earlier deregulation push, the utilities also had everyone on board to pay them “stranded costs” for their large generating plants. Thankfully the A.G. stood up to that pointing out that deregulation is a disaster where ever it goes, and that the claimed “stranded costs” were really stranded assets, and if anyone owed anyone money, the utilities owed us for their assets that were paid for and fully depreciated. Read Corneli on Stranded Assets. This is not new to utilities. It is not our job to correct their business plan errors, to pay for their neglect, or to finance their market activities. More on this soon… but the short version, NO to SF 1735. NO to SF 1431. It’s not in the public interest. The question to ask is “What’s stopping utilities?” And it’s not our regulatory system. It’s that utilities are looking for additional ways to transfer their costs to ratepayers without regulatory review. URGENT – TOMORROW – HF 341 in Committee! Tomorrow the House Jobs Growth and Energy Affordability Policy and Finance Committee will take up HF 341, see also SF 237, to provide an exemption from Certificate of Need for natural gas plants that sell power into the MISO market. The Power Plant Siting Act, specifically Minn. Stat. 216E.04, Subd. 2(2) already gives natural gas plants a free ride by allowing “alternate review,” which is “review lite.” For example, the “Simon Says” 325 MW natural gas plant that had been planned for Waseca would have been built. The 700-800 MW Sunrise River Station by the Chisago sub would have been built. WHY? Should a community be subject to living with a HUGE natural gas plant without regulation? Nope, no way, no how. Plus who will pay for the transmission interconnection, and how will that be regulated, both “need” and routing… and then there’s eminent domain! What’s the impact on Minnesota utilities and their service territory? The biggest problem? If it’s not regulated by the PUC, who handles it? Counties. What county has the expertise or resources to review and permit a power plant? Most likely it’s as in Freeborn County, where they cut and pasted the project APPLICATION and called it an EIS! Really! Or look at Chisago County and the Sunrise River natural gas plant. That’s not something that should be thrown at a local government. Please let them know how important it is that we continue to regulate natural gas plants. A power plants is large, expensive infrastructure with large, costly impacts, and should only be built when and where needed, after a full Certificate of Need and Siting review. 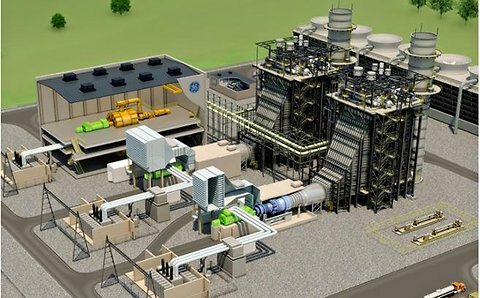 LS Power’s Sunrise River plant voted DOWN! What about the Mesaba Project which has a site permit good until 2019, and which couldn’t demonstrate either “need” or that it would provide reasonably priced electricity — under this bill, a large natural gas plant could go up on that site without any further review! More info HERE on Mesaba Project! That’s what communities think of having a natural gas plant using their water, making noise, being lit up 24/7, and all for the profit of some absentee corporate owner: Thanks, but NO THANKS! 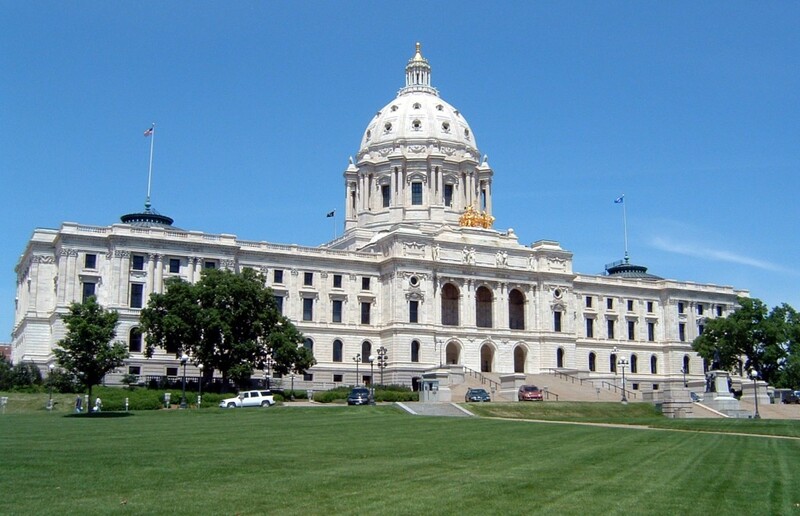 Overview of natural gas issues in Minnesota.If you wish to testify on HF341, please contact Committee Legislative Assistant, Jonathan Fortner, at jonathan.fortner@house.mn. HF341 – (Swedzinski): Requirement to obtain certificate of need prior to construction of a natural gas plant generating electricity that is exported from the state eliminated. Is this exciting or what?!?! Each state where transmission projects are proposed should get going and enact “Buy the Farm.” I’ve had a request to pass this around far and wide, so here goes! Minn. Stat. 216E.12, Subd. 4. Contiguous land. (a) When private real property that is an agricultural or nonagricultural homestead, nonhomestead agricultural land, rental residential property, and both commercial and noncommercial seasonal residential recreational property, as those terms are defined in section 273.13 is proposed to be acquired for the construction of a site or route for a high-voltage transmission line with a capacity of 200 kilovolts or more by eminent domain proceedings, the owner shall have the option to require the utility to condemn a fee interest in any amount of contiguous, commercially viable land which the owner wholly owns in undivided fee and elects in writing to transfer to the utility within 60 days after receipt of the notice of the objects of the petition filed pursuant to section 117.055. Commercial viability shall be determined without regard to the presence of the utility route or site. Within 60 days after receipt by the utility of an owner’s election to exercise this option, the utility shall provide written notice to the owner of any objection the utility has to the owner’s election, and if no objection is made within that time, any objection shall be deemed waived. 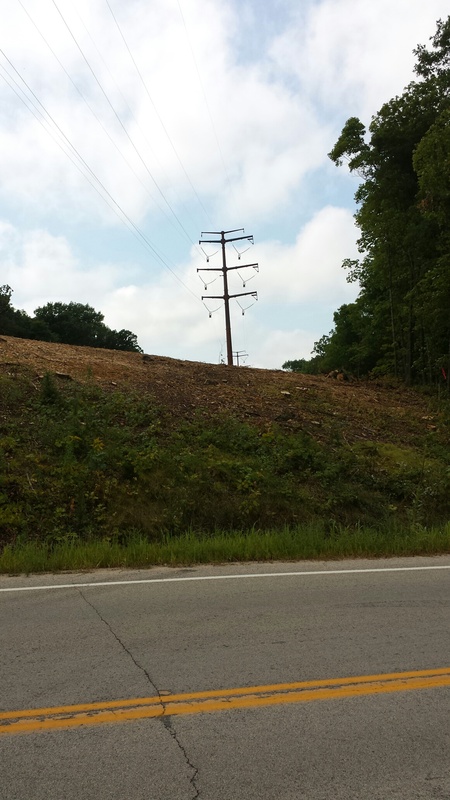 Within 120 days of the service of an objection by the utility, the district court having jurisdiction over the eminent domain proceeding shall hold a hearing to determine whether the utility’s objection is upheld or rejected. The utility has the burden of proof to prove by a preponderance of the evidence that the property elected by the owner is not commercially viable. The owner shall have only one such option and may not expand or otherwise modify an election without the consent of the utility. The required acquisition of land pursuant to this subdivision shall be considered an acquisition for a public purpose and for use in the utility’s business, for purposes of chapter 117 and section 500.24, respectively; provided that a utility shall divest itself completely of all such lands used for farming or capable of being used for farming not later than the time it can receive the market value paid at the time of acquisition of lands less any diminution in value by reason of the presence of the utility route or site. Upon the owner’s election made under this subdivision, the easement interest over and adjacent to the lands designated by the owner to be acquired in fee, sought in the condemnation petition for a right-of-way for a high-voltage transmission line with a capacity of 200 kilovolts or more shall automatically be converted into a fee taking. (b) All rights and protections provided to an owner under chapter 117 apply to acquisition of land or an interest in land under this section. (c) Within 120 days of an owner’s election under this subdivision to require the utility to acquire land, or 120 days after a district court decision overruling a utility objection to an election made pursuant to paragraph (a), the utility must make a written offer to acquire that land and amend its condemnation petition to include the additional land. (d) For purposes of this subdivision, “owner” means the fee owner, or when applicable, the fee owner with the written consent of the contract for deed vendee, or the contract for deed vendee with the written consent of the fee owner. Here are some photos I took yesterday of the CapX 2020 transmission project being constructed at White Bridge Rd. 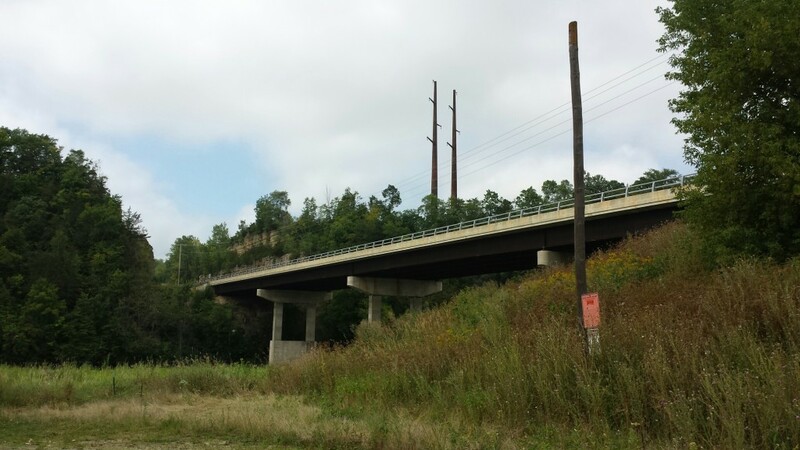 over the Zumbro River — UGLY UGLY UGLY, it’s ugly wherever it goes. A long-time energy activist recently called “Buy the Farm,” Minn. Stat. 216E.12, Subd. 4, MY statute. And in a way, it is… For at least 15 years now, since the Chisago and Arrowhead Project, its been a constant mantra. I’ve been raising “Buy the Farm” in the administrative dockets, the courts and the legislature. If I had a dollar for every “Buy the Farm” flyer I’ve handed out at transmission line meetings and hearings, every mile driven across Minnesota, every hour greeting attendees, every legislator hounded, I’d never have to work again. In 1999, World Organization for Landowner Freedom went to the Appellate Court after Minnesota Power filed for an exemption of its Arrowhead Transmission Project at the Environmental Quality Board and the exemption was granted by the EQB. 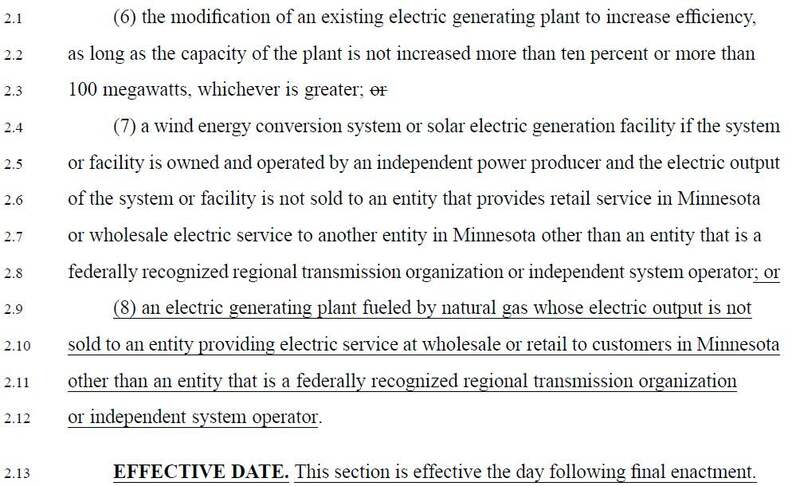 Minnesota Power requested this exemption because the line was so short it was exempted from a Certificate of Need, so what the heck, let’s try to get it exempted from Power Plant Siting Act’s Routing requirements as well… and they did. One “unintended consequence” was that because it was exempted from the Power Plant Siting Act, landowners affected by the project were not able to elect “Buy the Farm” because it is part of the Power Plant Siting Act. But of course, I don’t think that was “unintended” at all. In eminent-domain proceedings for projects subject to the siting act, landowners can elect condemnation and compensation for owner’s entire fee interests. See Minn. Stat. 116C.63, subd. 4 (2000) (take-the-whole-farm option). WOLF argues that due process requires that notice to landowners should have included notice that if an exemption is granted, the take-the-whole farm option will not be available to them. The siting act is unambiguous, however, and provides all the notice required that the take-the-whole-farm option does not apply to projects exempted from the act. MP complied with the specific application-for-exemption notice requirements in the siting act. See Minn. Stat. 116C.57, subd. 5 (2000). No one challenged the sufficiency of notice to landowners in the proceedings before the board. We find WOLF’s argument on this issue meritless. Ja, tell that to the landowners under the 345 kV line… (and btw, sufficiency of notice WAS raised). Buy the Farm — A Win For The Home Team! This decision establishes yet another point on the “Buy the Farm” line showing that landowners do have rights, and can elect the Buy the Farm option. If only the Public Utilities Commission and the Administrative Law Judges working these cases would get that message. The trend continues… Buy the Farm is the law in the state of Minnesota. Utilities, get used to it. If you want to take land, pony up. Will Xcel challenge this District Court decision? We shall see, and if they do, we’ll have Amicus “pen” in hand to again join the fracas in support of landowners.